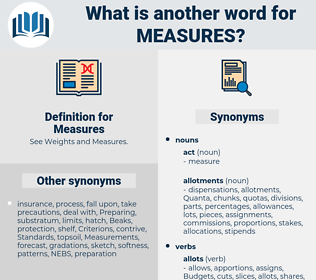 What is another word for Measures? countermeasures, precautions, measured, countermeasure, measurement. counter-measures, benchmarks, Tests, yardsticks, countermeasures, checks, degrees, precautions, measurement. 22, 5, 25, 31, 3, 13, action. 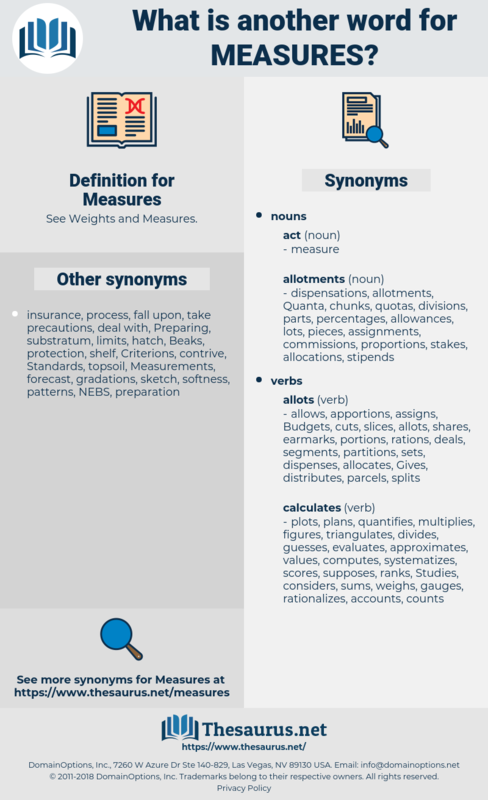 mmeasures, medidas, Regulations, amendments, elements, judgements, ALMPS, deeds, projects, obligations, states, Equities, arrangements, Communities, Canadians, approaches, operations, requirements, ways, conditions, methods, safeguards, indicators, laws, Policies, rules, practices, Standards, clauses, shares, CBMS, Facilities, Remedies, articles, options, dispositions, Rights, controls. scheme, arrangements, system, approach, approaches, misure, a., methodology, methodologies, mechanism, mechanisms, operations, Recommendations, techniques, legislation, e., requirement, requirements, ways, conditions, methodological, solution, method, methods, safeguards, prevention, international, regulation, implementation, parts, programme, programmes, targeting, Aimed, progress, information, indicator, indicators, issue, program, Programs, intervention, interventions, laws, formula, strengthening, environmental, strategy, afghanistan, insurance, administrative, policy, Policies, rules, government, Undertaken, enforcement, directive, plan, practices, Standards, Responding, security, e, clauses, member, processes, bulletin, research, share, shares, harvest, CBMS, provisional, facility, Facilities, development, remedy, Remedies, use, dimensions, management, crackdown, general, article, articles, minister, procedural, concerning, impact, state, Pertaining, machinery, Aiming, ensuring, implications, taken, options, Efforts, access, catch, catches, commission, alberta, education, emergency, review, Them, protection, disposition, dispositions, nuclear, proceeding, auditor, how, annex, norms, proponent, tools, directed, mitigation, coordination, number, Relating, relevant, aids, disability, Resources, objectives, relief, safety, Kong, section, sections, intended, designed, quebec, appendix, These, respect, modalities, may, department, trade, december, context, to, business, Incentives, key, h., voter, promotion, seeking, j., traffic, arrangement, branch, legal, goal, Placing, committee, application, -lsb-, stock, The, equity, basic, wednesday, for, gdp, new, tips, Rights, CRC, community, Tel, made, ec, mc, text, health, mission, national, Von, claims, change, officer, hiv, council, Children, controls, Against, joint, public, office, canada, mesure, un, action, actions. circumstances, purposes, matters, assessments, characteristics, structures, instructions, Gestures, agreements, terms, metres, rates, determinations, pressures, considerations, authorities, meters, parameters, medidas, factors, calculates, manoeuvres, formalities, times, arms, Surveys, proposals, representations, Guarantees, Evaluations, cures, extents, effects, values, principles, resolutions, MEDIAS, Adjustments, numbers, Regulations, calculations, Concentrations, messages, sums, thresholds, effectiveness, consequences, Scales, outcomes, courses, statements, averages, Researchers, endeavours, statutes, media, restrictions, issues, Areas, reductions, transactions, dissemination, evaluates, enactments, announcements, indications, Suggestions, aspects, components, farmers, customers, amendments, strategies, Prescriptions, Investigators, reservations, bars, replicates, elements, appropriations, Criteria, respects, sources, suppliers, documents, assets, Achievements, results, prohibitions, alternatives, barriers, variables, directives, consumers, schemes, Judgments, features, judgements, findings, jobs, releases, Exercises, netherlands, reprisals, substances, reports, S, Irregularities, ALMPS, Reinforcements, savings, Indexes, Indices, instances, L, channels, accommodations, enhancements, roads, Disincentives, systems, improvements, Guidelines, members, welfare, forecasts, deeds, ratios, figures, except, relations, tactics, supports, statistics, customs, others, published, uses, emissions, attempts, imperatives, projects, stakeholders, contributions, things, solutions, Phenomena, practises, data, constraints, devices, bills, endeavors, speakers, qualifications, IMPACTS, considers, sizes, installations, destruction, Ideas, materials, preparations, Treaties, amounts, modifications, situations, details, stipulations, increases, levels, limitations, answers, orders, reasons, derogations, demarches, Studies, more, responsibilities, item, items, employers, limits, STRIDES, layers, conclusions, reviews, enterprises, reactions, continues, exemptions, reserves, protections, deliverables, contents, beats, appliances, regimes, sanctions, Investments, concessions, Possibilities, frameworks, services, packages, pieces, fields, stages, audits, mitigations, minors, charter, threats, campaigns, prosecutions, infringements, supplies, institutions, grounds, Inhalers, Freedoms, Governments, reforms, functions, finances, advancement, concepts, positions, markets, works, disciplines, diversions, individuals, Risks, Mosquitoes, obstacles, decisions, tasks, speeches, commitments, avenues, directions, monies, plans, cases, sites, Opportunities, burdens, Capabilities, tariffs, mayors, Forms, affairs, !, payments, Animals, Drugs, concerns, appeals, Paths, workers, traffickers, protocol, protocols, Securities, regions, facts, demands, roma, injunctions, discussions, developments, readings, points, Duties, allocations, views, priorities, cooperation, questions, stocks, models, executions, continued, partners, inputs, modes, Prices, governance, products, providers, agents, imports, requests, departments, sectors, Businesses, Taxes, obligations, _, special, Fisheries, sentences, events, states, benefits, Capacities, device, annexes, kinds, funds, Firms, Minorities, themes, endpoints, Grants, agency, Penalties, accidents, comments, Roles, beacons, levers, type, types, buildings, groups, Ones, fight, Goals, clues, Motions, women, pleas, Companies, add.1, citizens, challenges, applications, -rrb-, victims, costs, Equities, Grips, D, technologies, assesses, Crises, problems, airports, violations, sets, -, nets, arrangements, experts, innovations, actors, suits, fleets, Bis, Charges, powers, who, advances, weapons, Infections, gaps, choices, fronts, Vehicles, texts, Gains, ", accounts, paints, Missions, posts, flags, holding, taking, Libraries, lists, C, approaches, needs, changes, Fees, Economies, Clients, police, MINES, inks, Parties, 2003, 2004, thailand, methodologies, Countries, mechanisms, operations, 2020, 2002, Recommendations, techniques, 63, requirements, ways, conditions, ii, 2000, methods, safeguards, 2001, prevention, parts, programmes, indicators, cuts, Programs, interventions, laws, twelve, Policies, rules, practices, Standards, clauses, processes, shares, CBMS, Facilities, development, Remedies, dimensions, article, articles, minister, implications, options, LINEs, Efforts, catches, dispositions, how, norms, tools, aids, Resources, objectives, sections, modalities, Incentives, promotion, gdp, Rights, ec, claims, Children, controls. stimulus, repressive, toolkit, arrangement, step, move, action. used, identified, recommended, retention, Introduced, Enabled, Were, Acted, Those, added, adopted, Had, needed, Did, Them, intended. Addressing, representing, existing, moving, exercising, implementing, Preventing, raising, Outlining, helping, being, Enhancing, Promoting, dealing, Granting, acting, talking, controlling, taking, Doing, Responding, ensuring, Relating, action. addressed, Targeted, imposed, proved, Introduced, practised, associated, utilized, Acted, focussed, exploited, done, Aimed, Undertaken, taken, Efforts, intended, designed, action. estimates, evaluating, Addresses, reduction, manner, rate, proposes, terms, rates, requires, determinations, establishes, medidas, calculates, any, des, agenda, is, restrictions, evaluates, attaches, results, features, provides, allows, Has, supports, Of, attempts, data, considers, takes, works, speeches, plans, on, Forms, stocks, assess, events, states, challenges, Does, assesses, arrangements, makes, approaches, needs, methodologies, mechanisms, evaluate, requirements, conditions, methods, precautions, programmes, targeting, indicator, indicators, intervention, interventions, strategy, policy, Policies, rules, plan, clauses, processes, shares, Remedies, Aiming, modalities, for, claims, controls, action, actions. prevent, introduce, react, intervene, protect, risk, levy, adopt, receive, happen, assess, evaluate, plan, quantify, step, move, action. Other measures necessary to be taken in view of the Spanish war were also discussed. They detest half - measures and compromise. manger, maigre, mauser, moniker, macro, megaera, make grow, masquer, muncher, mimicker, maser, maseru, miscarry, moneymaker, mugger, manager, Mesozoic Era, mojarra, manicure, make sure, maker, micro, masseur, meagre, menninger, mimicry, missouri, mincer, meager, monsieur, massager, mucor, mouse hare, masker, magyar, miser, mixer, mouse ear, makaira, muser, misery, measurer, massacre, maiger, money cowrie, minicar, major, mocker, musher, mazer, menagerie, mouser, masher, magic square, Masorah, muscari, Mick Jagger, mcgraw, manchuria, mascara, moocher, mysore, Mens Rea, monger, Masora, mockery, macer.